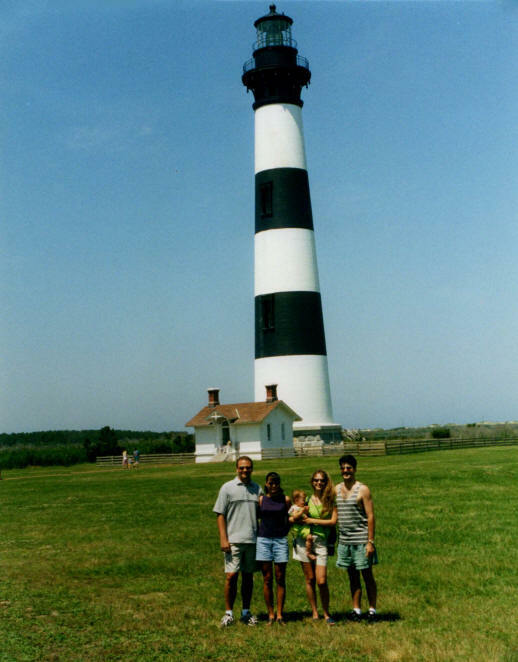 Our entire family did a summer beach trip to the North Carolina Outer Banks from Saturday June 16 to Saturday Jun 23 in 2001. 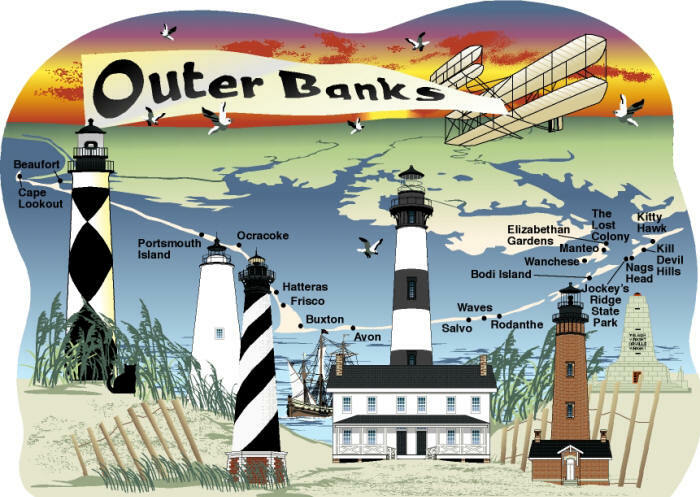 Not only did we enjoy the beach, but we visited the Elizabethan Gardens, saw The Lost Colony drama, visited the Wilbur & Orville Wright Brothers Museum as well as the various Lighthouses on the NC Coast. 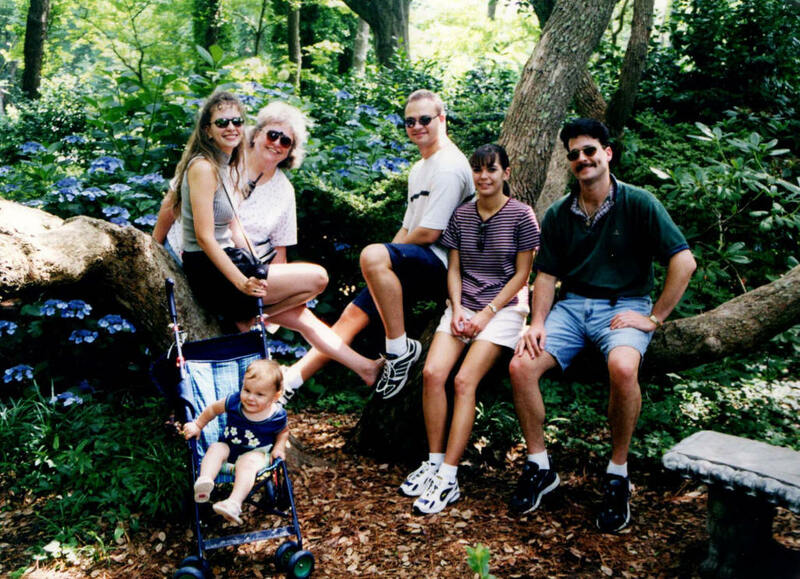 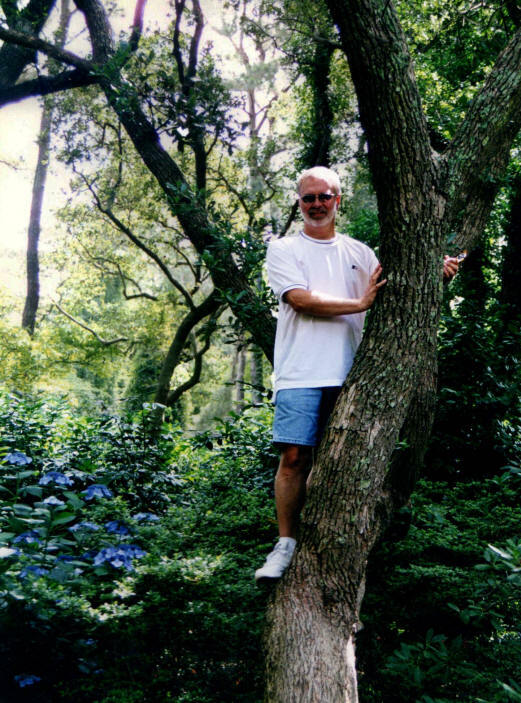 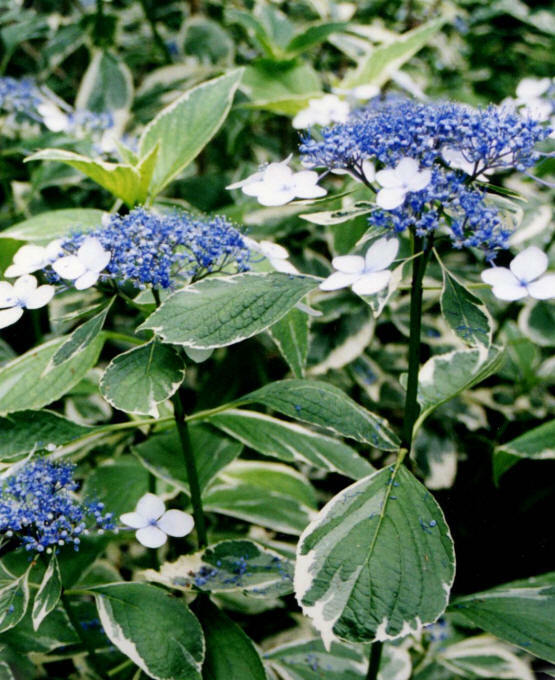 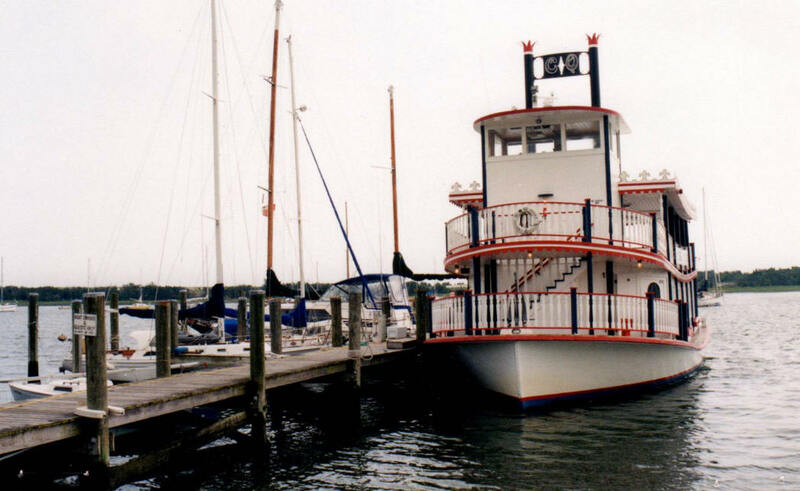 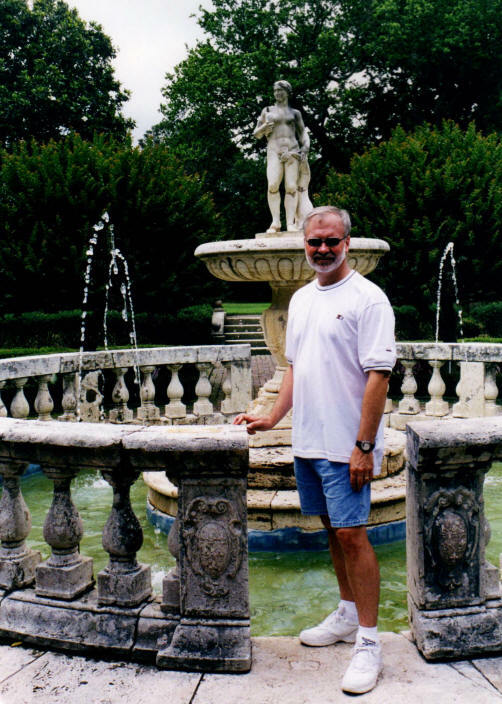 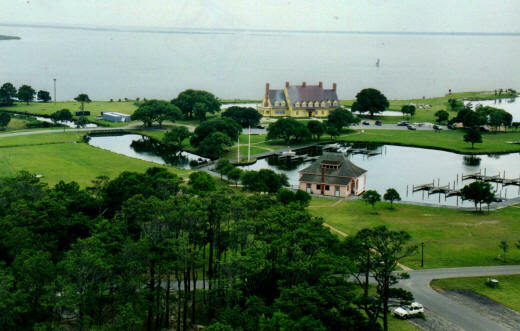 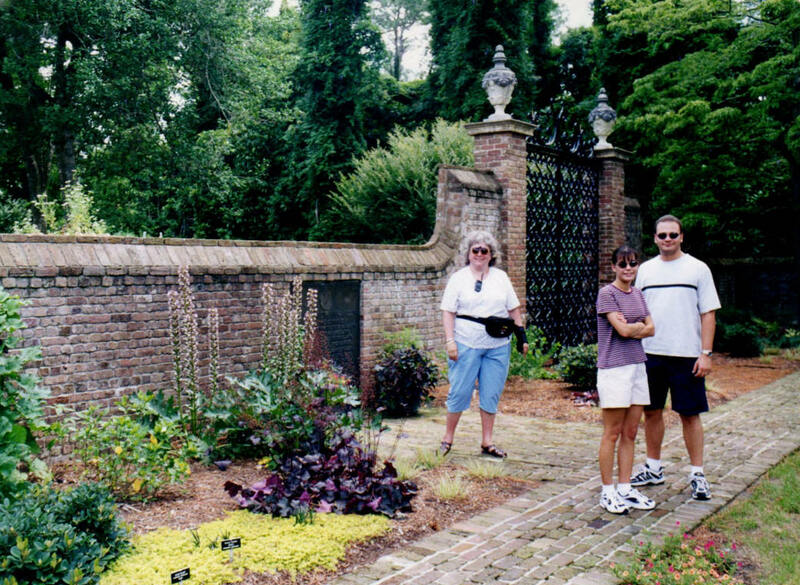 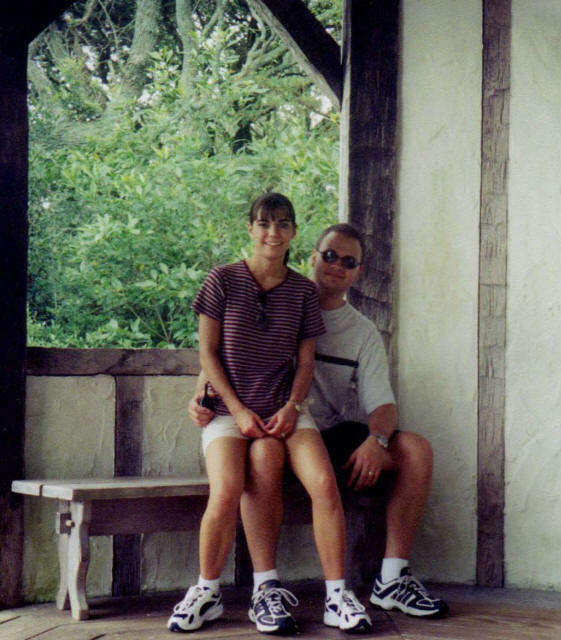 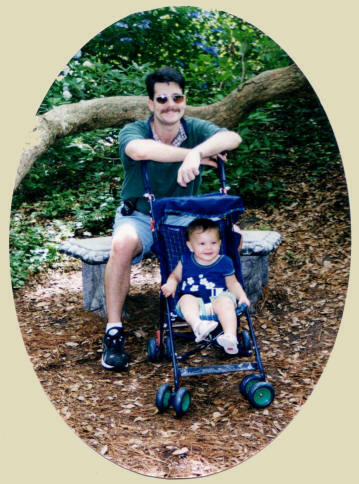 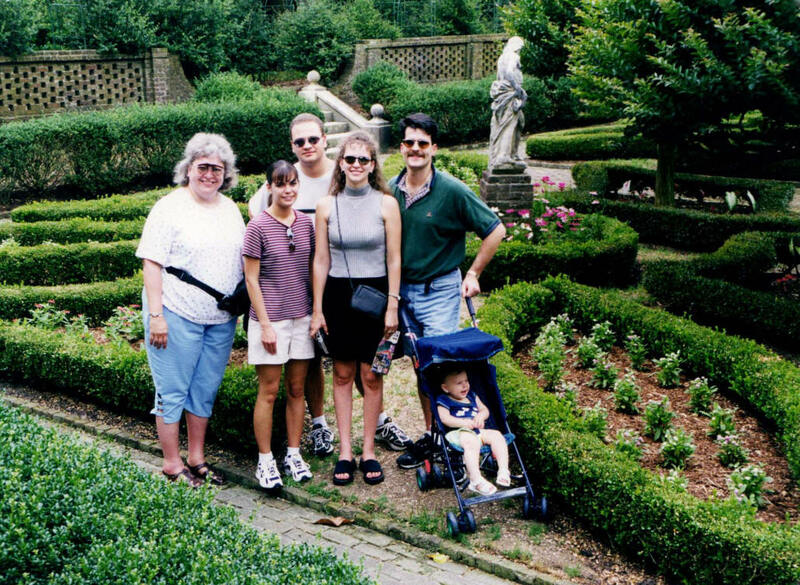 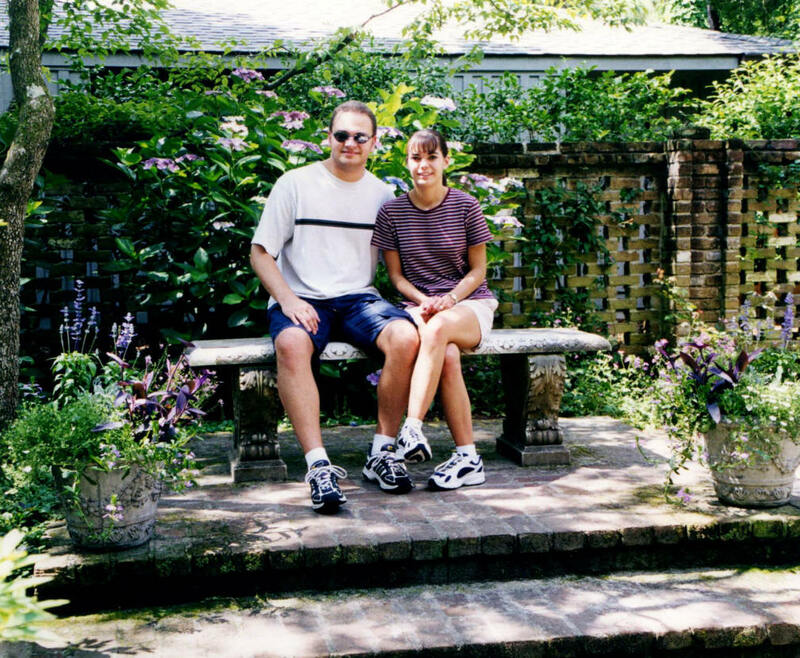 On 16 June 2001, as we were going through Manteo, we decided to stop and tour the Elizabethan Gardens. 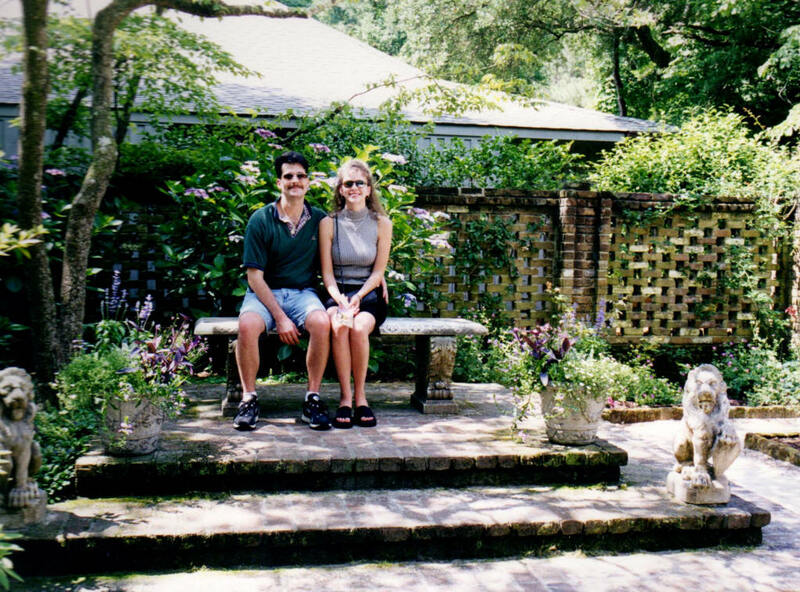 It cost $5 each for entrance, but the gardens were absolutely beautiful. 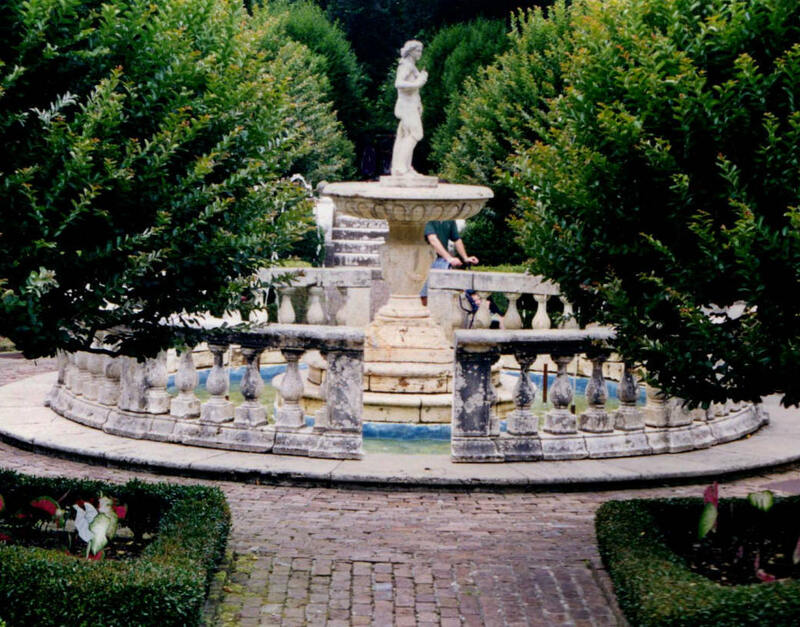 Fanciful and elaborate gardens were kept to entertain Queen Elizabeth I during her reign. 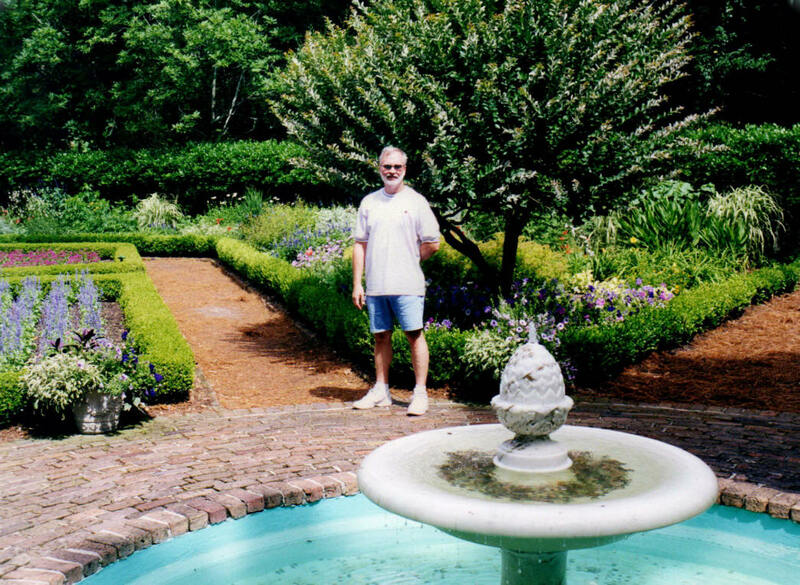 The Elizabethan Gardens in Manteo, NC, was created for your enjoyment, and as a living memorial to the time when Sir Walter Raleigh’s lost colonists lived in this very place over 400 years ago. 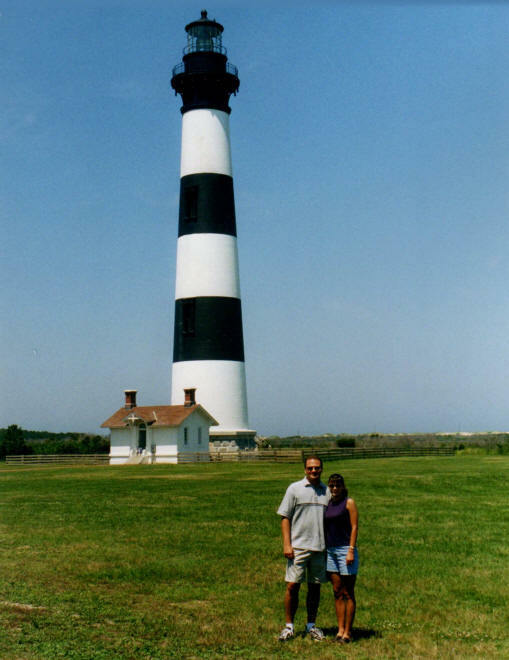 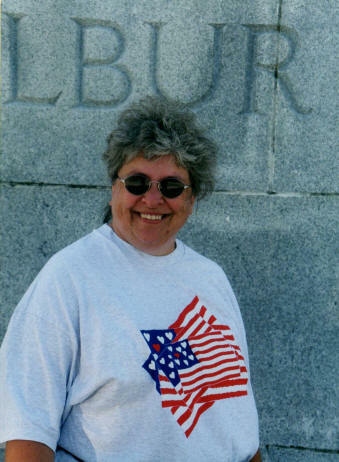 Sunday afternoon, 17 June 2001, Carolyn and I drove through Duck, NC, and headed to Corolla to see the Currituck Beach Lighthouse. 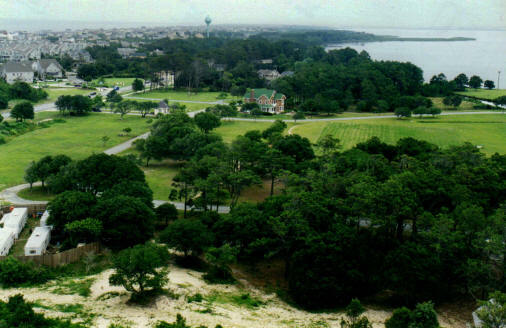 Both Duck and Corolla were extremely nice communities, but Corolla was definitely for the elite. 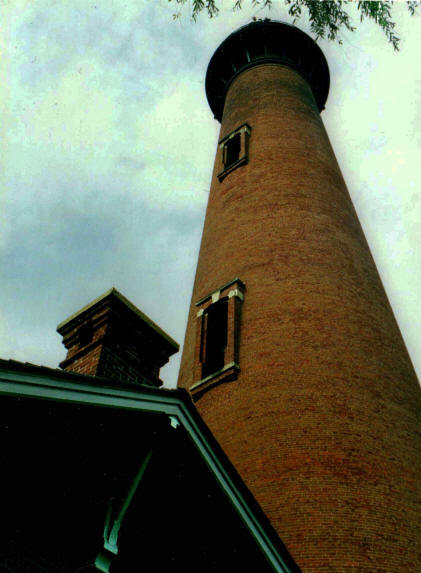 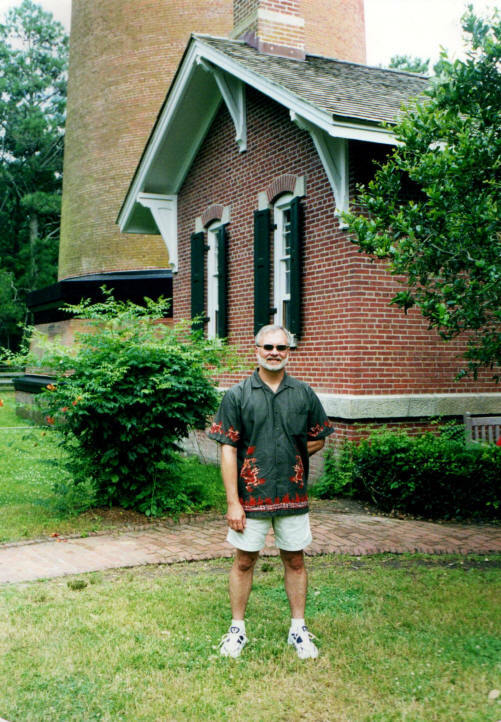 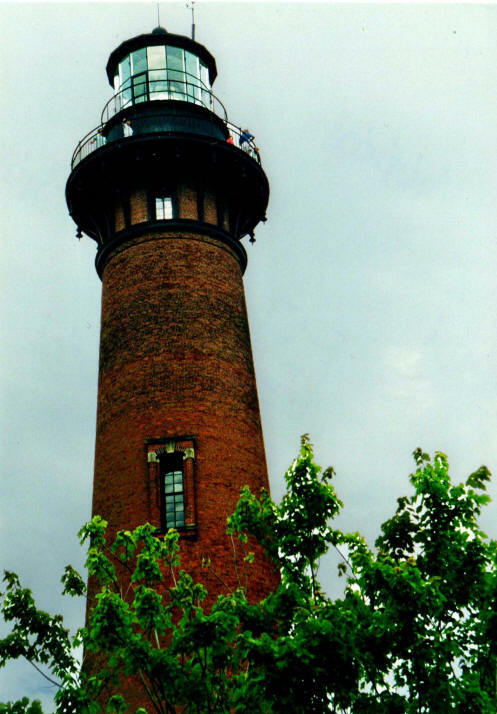 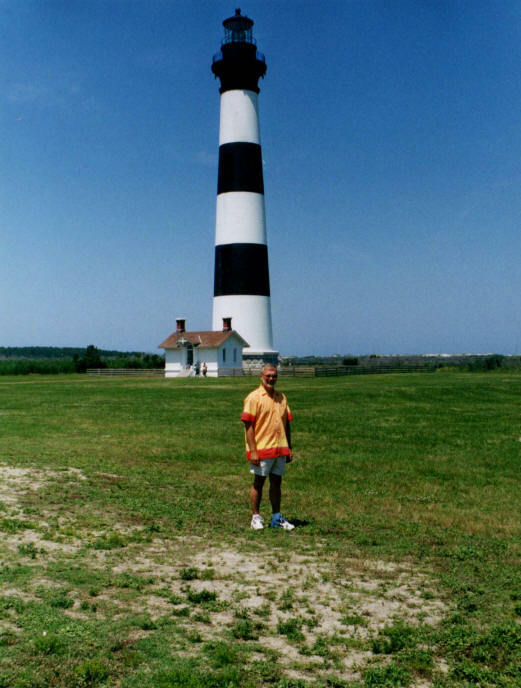 When we were there (2001), the Currituck Beach Lighthouse is the only lighthouse that was still open to the public so that you could climb to the top. 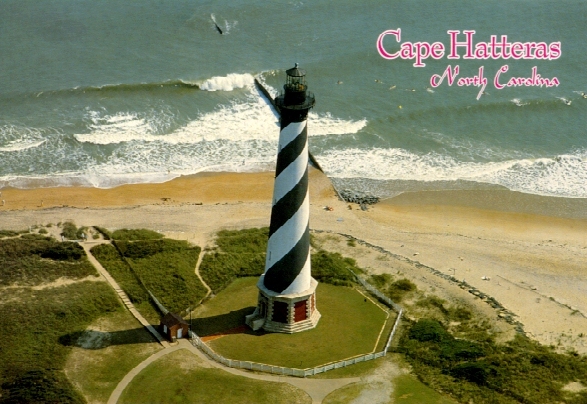 Cape Hatteras Lighthouse had been closed to the public the week before we got there. 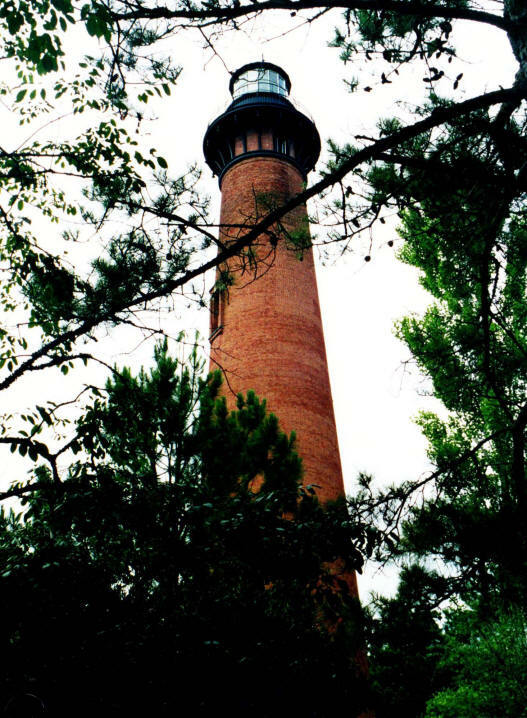 Carolyn didn't want to climb to the top of the lighthouse, but I did. 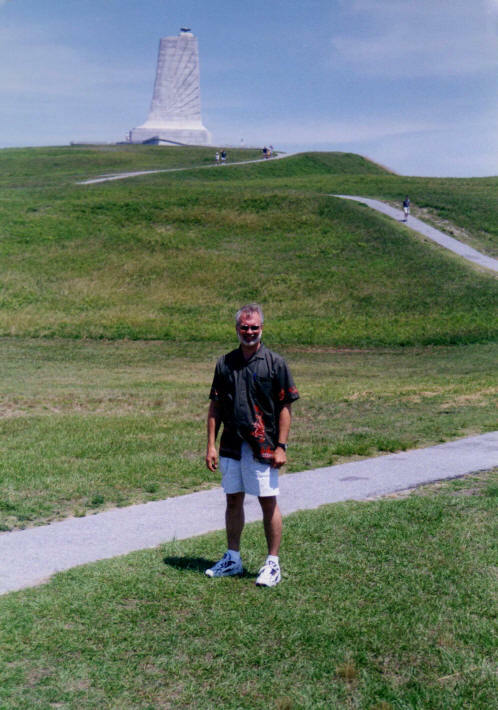 I paid $5 and headed toward the top. 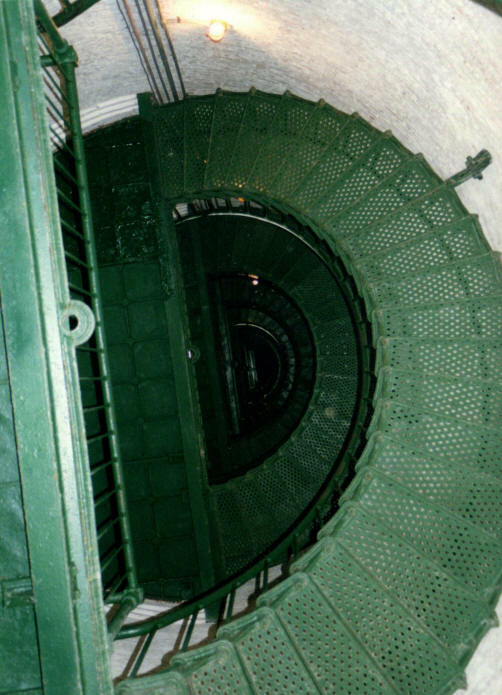 After I had climbed the first few flights of stairs, I looked up toward the top, and then back down toward the bottom. 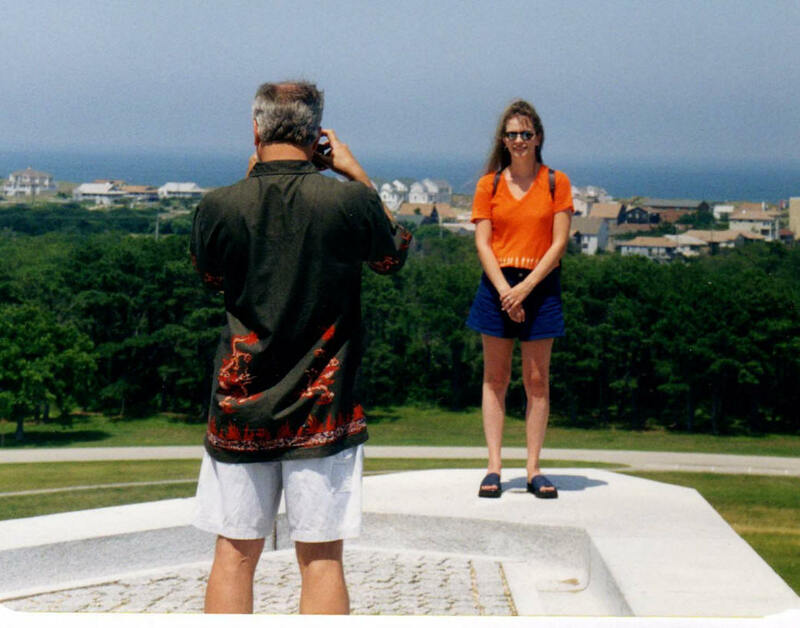 I didn't care if I had paid $5 for the opportunity to climb to the top, I wasn't so sure that I could do it. 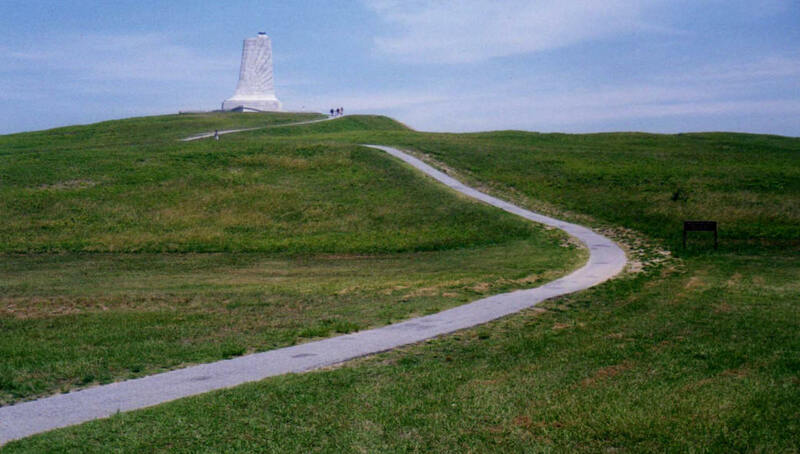 Finally, however, I pulled together enough courage to continue on to the top. 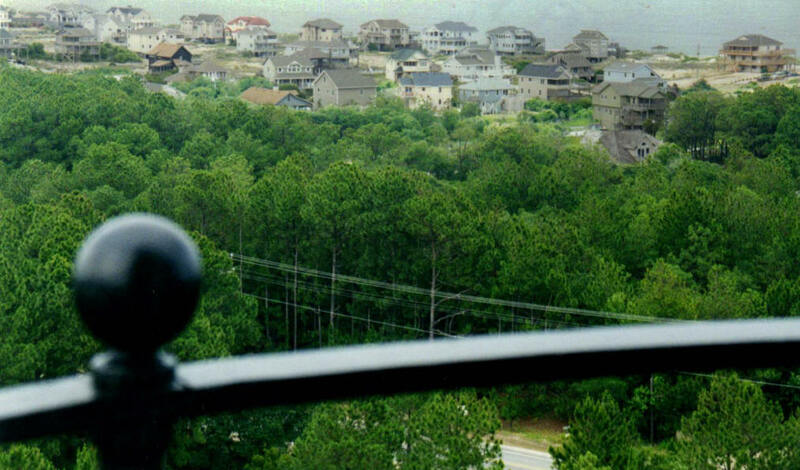 I finally made it and the view was beautiful. 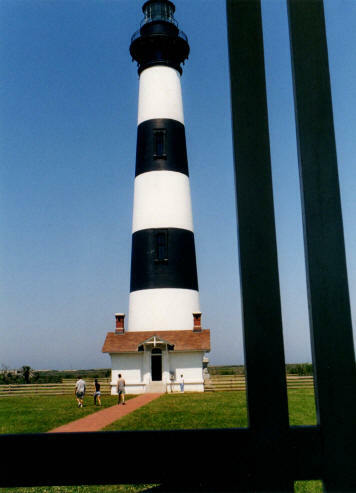 Even though I did make it to the top, I still had a hard time making myself get out on the deck around the massive light. 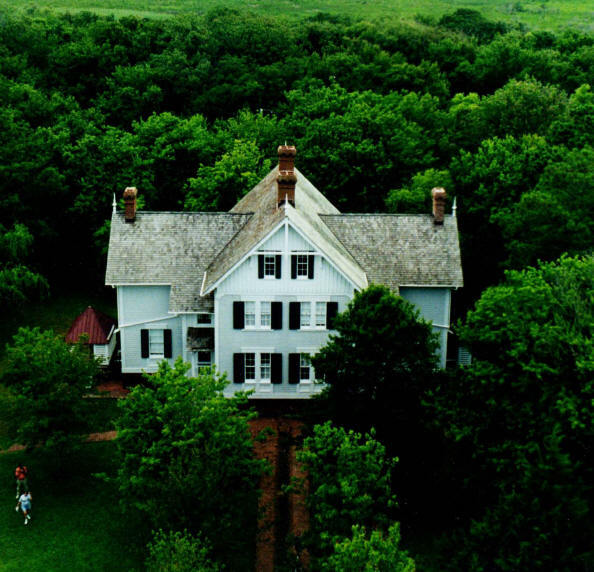 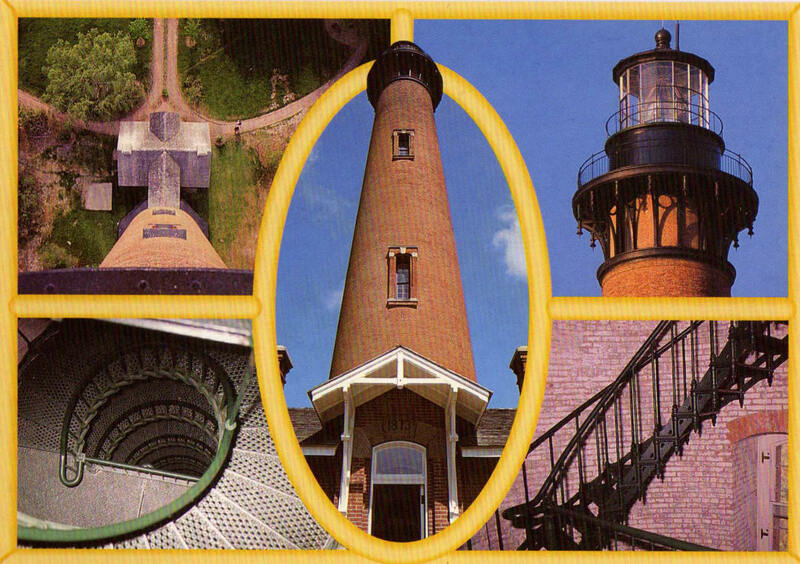 Visitors can still climb the winding staircase, 220 steps in all, to the top of the lighthouse for a panoramic view of Currituck Sound, the Atlantic Ocean and the Currituck Outer Banks. 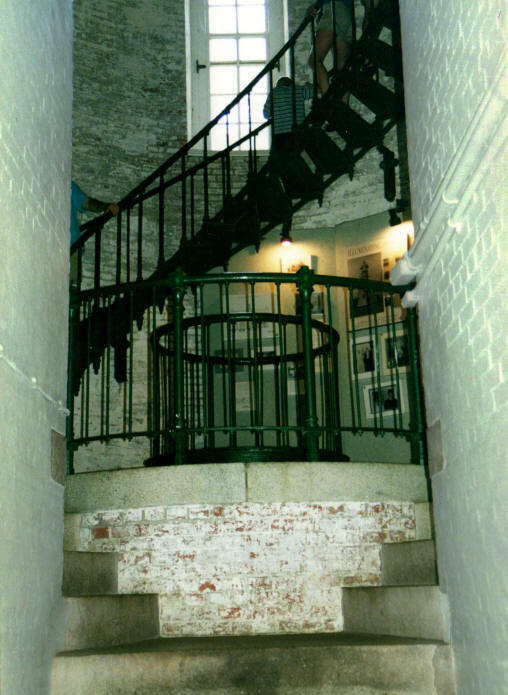 Inside the lighthouse, at the base and on the first two landings, there are lighthouse exhibits. 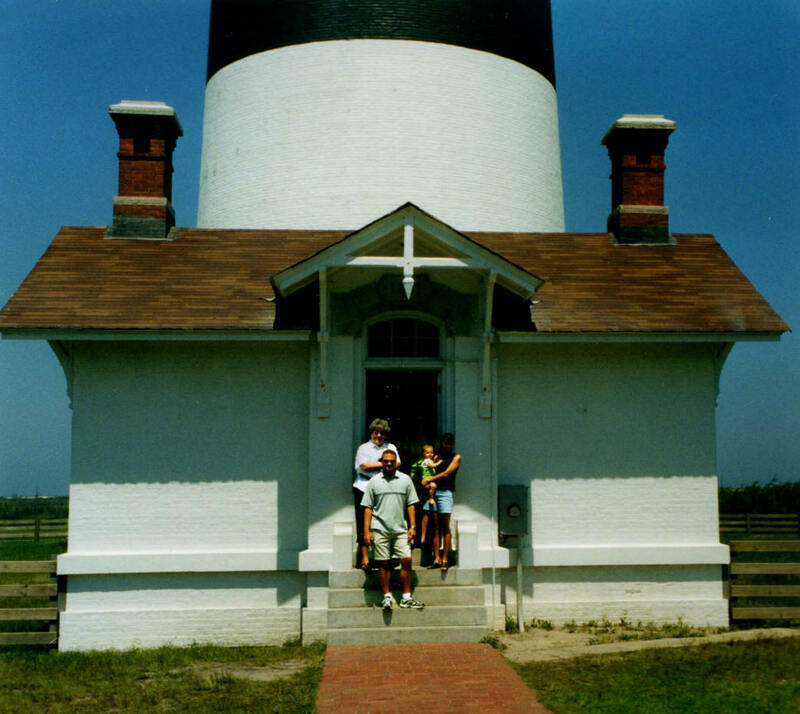 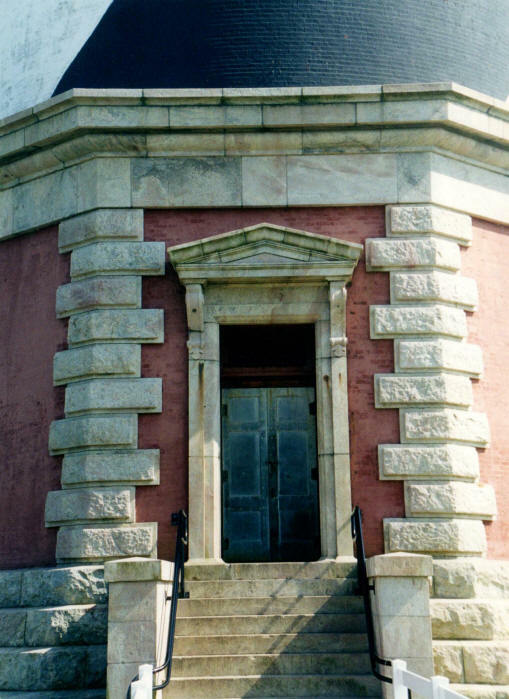 On the way up or down, you can stop to learn about the history of the coastal lighthouses. 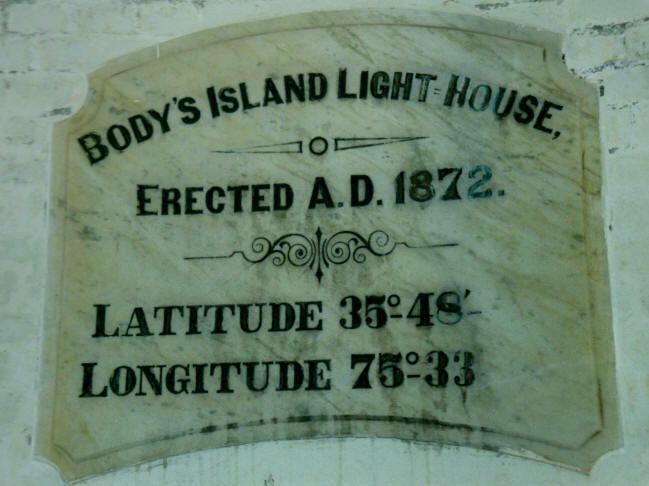 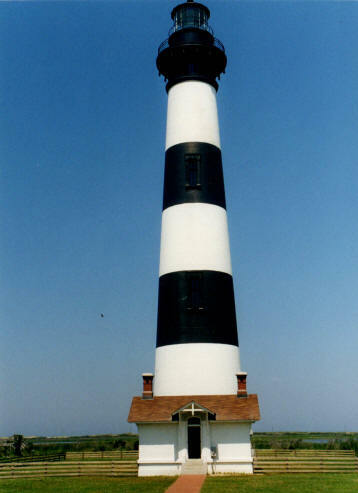 Like the other lighthouses on North Carolina’s Outer Banks, this one still serves as an aid to navigation. 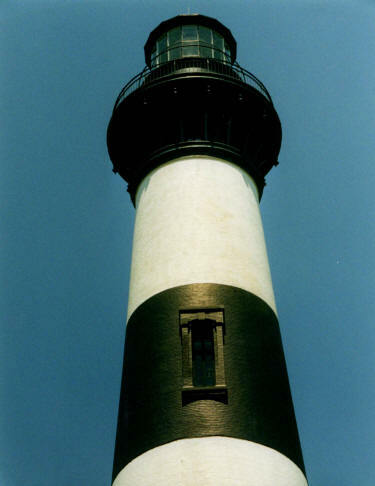 The beacon comes on automatically every evening at dusk and ceases at dawn. 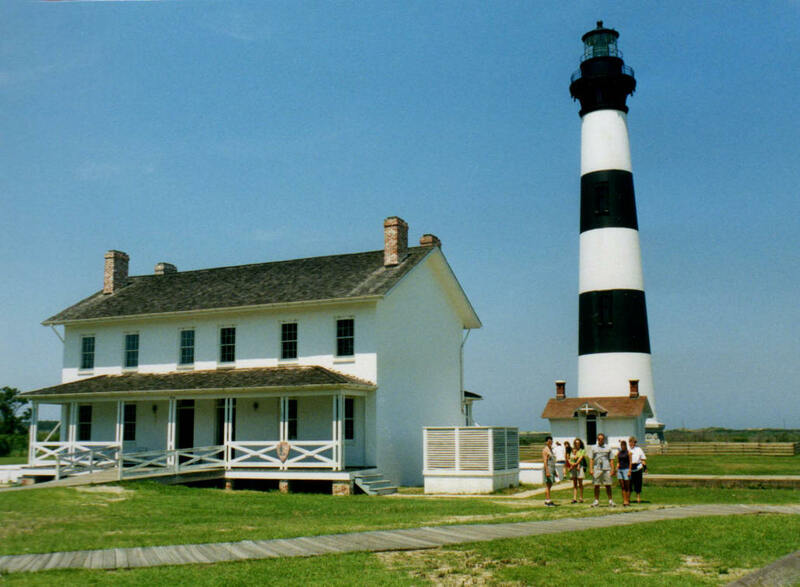 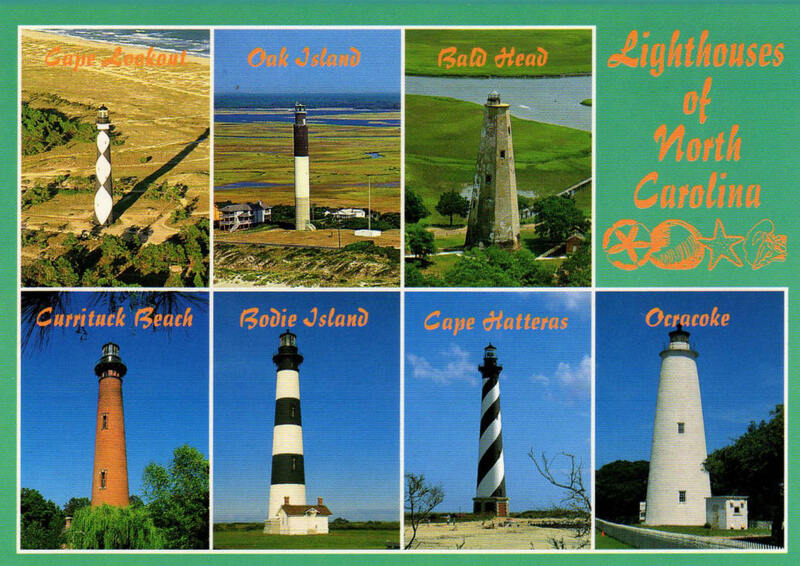 On Monday June 18th, we all decided to check out Bodie Island Lighthouse and Cape Hatteras Lighthouse. 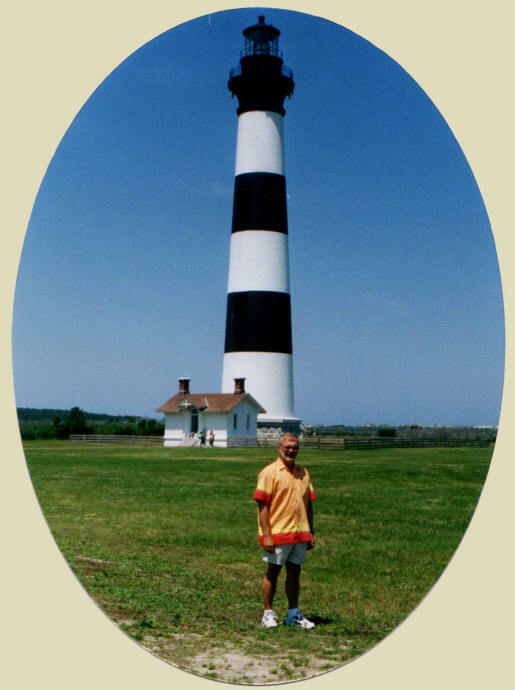 It was about an hour drive from where we were staying in Kill Devill Hills, NC, to the lighthouse. 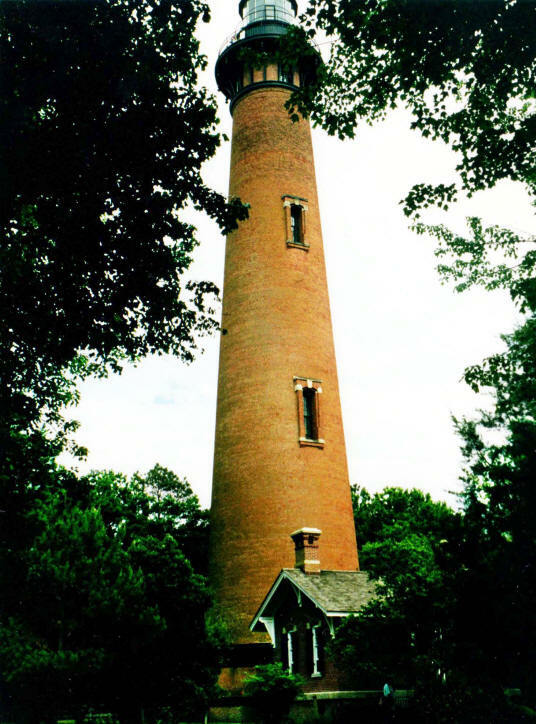 Bodie's Island Lighthouse is an exact duplicate of the Currituck Beach Lighthouse and were both built by the same architect. 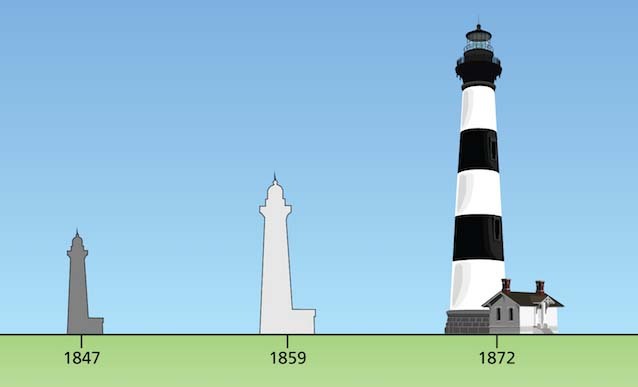 The only difference is the fact that Currituck kept its brick veneer while Body's Island Lighthouse was painted with black and white stripes. 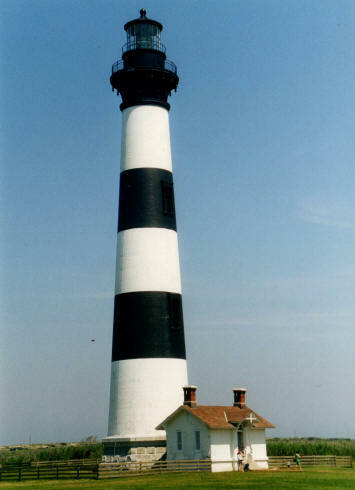 The current structure was erected in 1872 - Seven years after the end of the American Civil War. 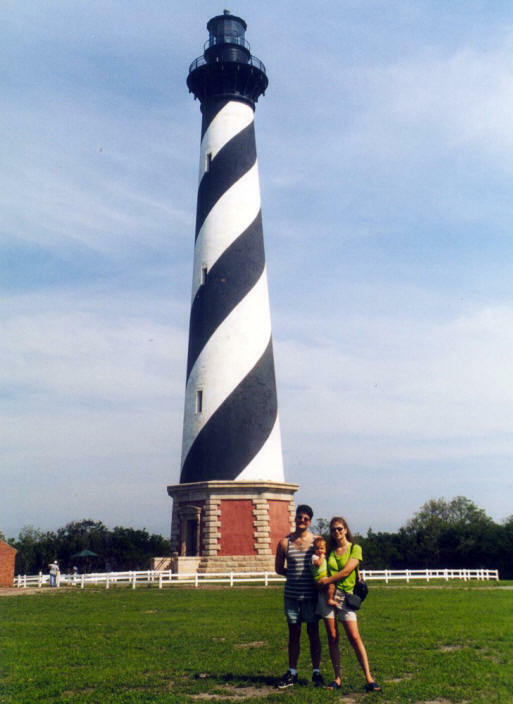 After visiting Bodie Island Lighthouse, we moved on to check out the Cape Hatteras Lighthouse. 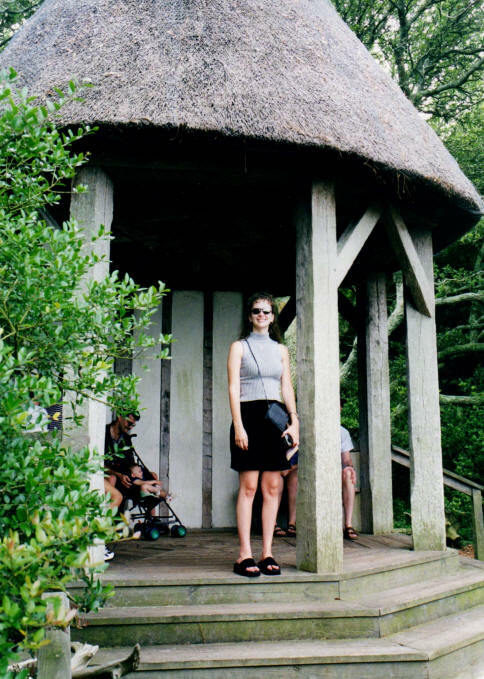 Humidity was extremely high during the Hatteras tour. 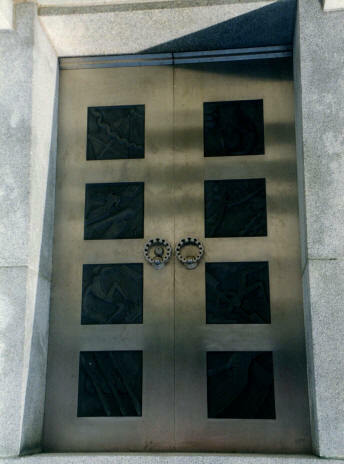 We were also disappointed that we couldn't go inside either. 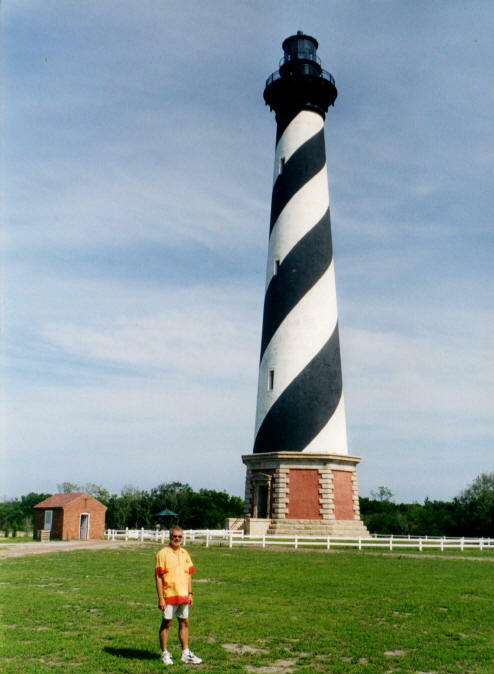 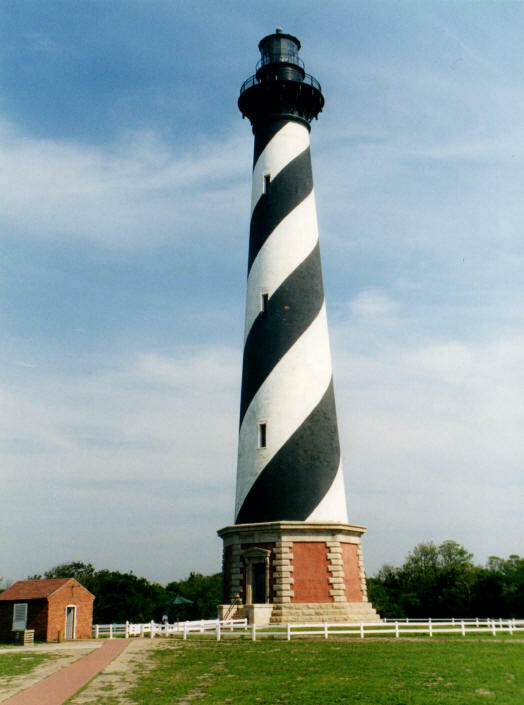 Cape Hatteras Lighthouse is the tallest brick lighthouse in the US. 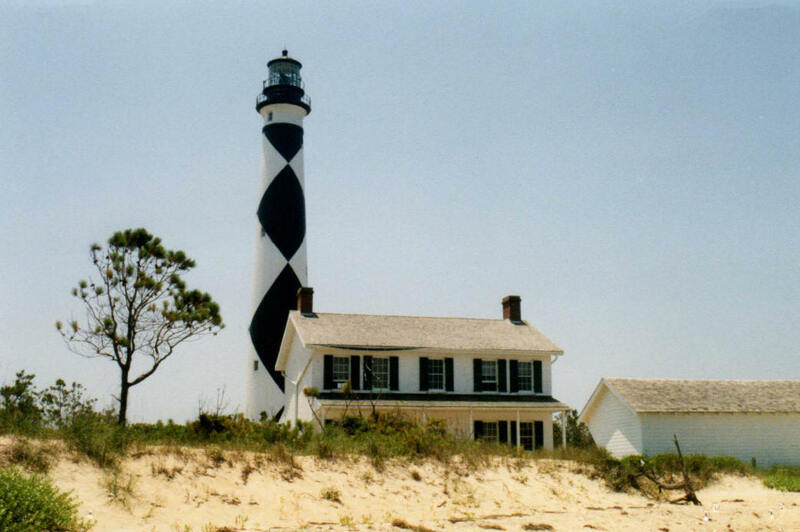 We didn't visit Cape Lookout Lighthouse on this trip to the Outer Banks. 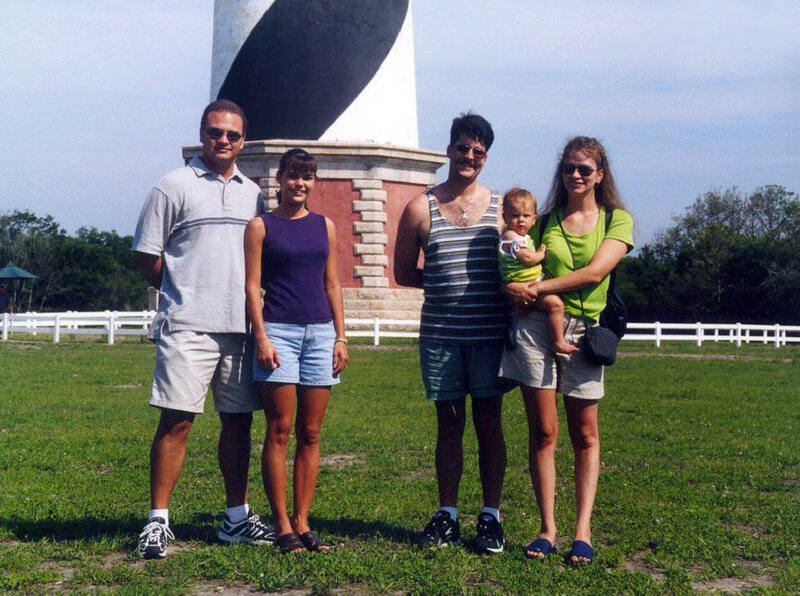 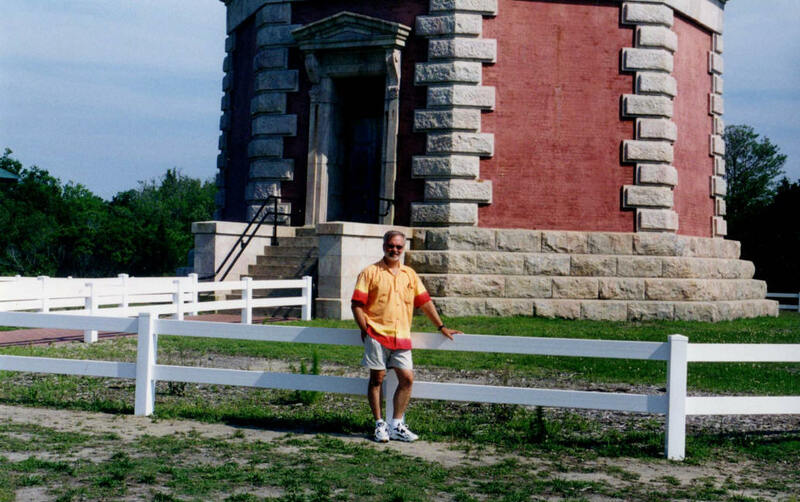 We did a beach trip with Dennis & Pat Hass in March 1998 and visited this particular lighthouse at that time. 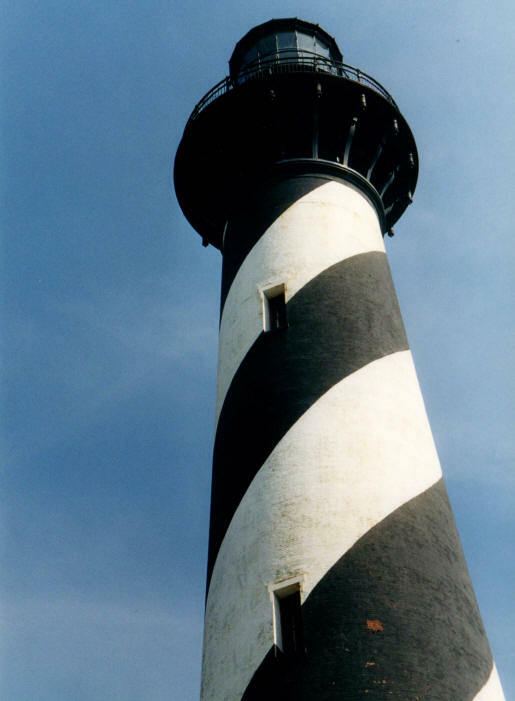 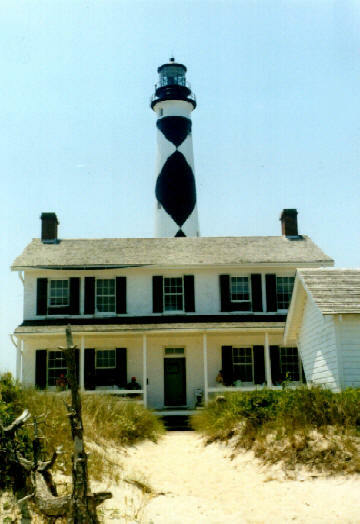 The following photos of the Cape Lookout Lighthouse were taken at that time. 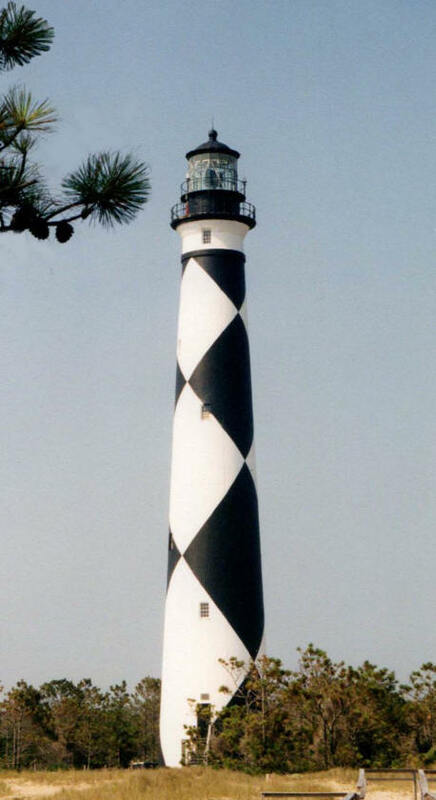 Cape Lookout National Seashore preserves a 56-mile long section of the Southern Outer Banks, or Crystal Coast, of North Carolina, running from Ocracoke Inlet on the northeast to Beaufort Inlet on the southeast. 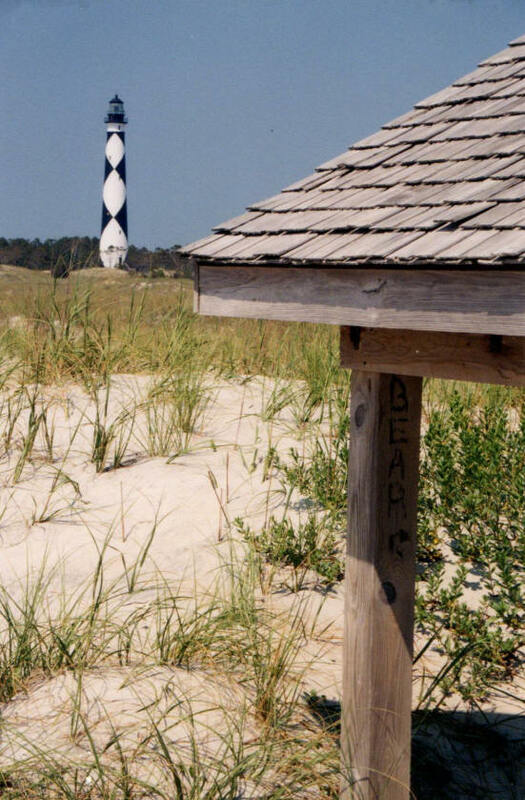 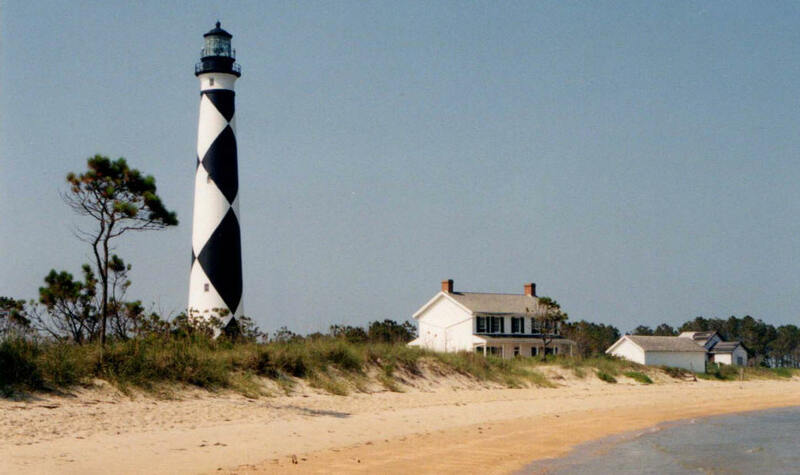 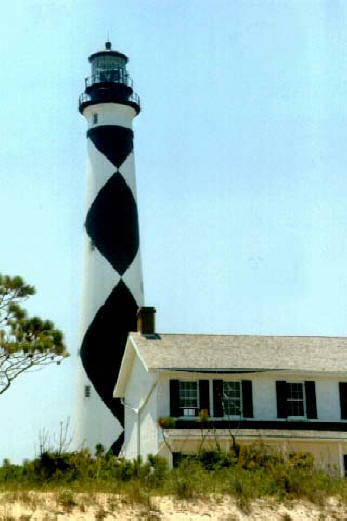 The seashore includes Shackleford's wild horses and the Cape Lookout Lighthouse, which has a black-and-white diamond pattern. 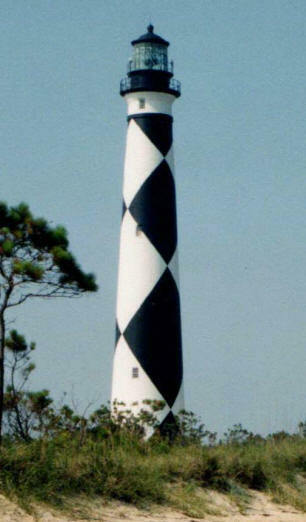 Built in 1859, the Cape Lookout Lighthouse is located on the Cape Lookout National Seashore. 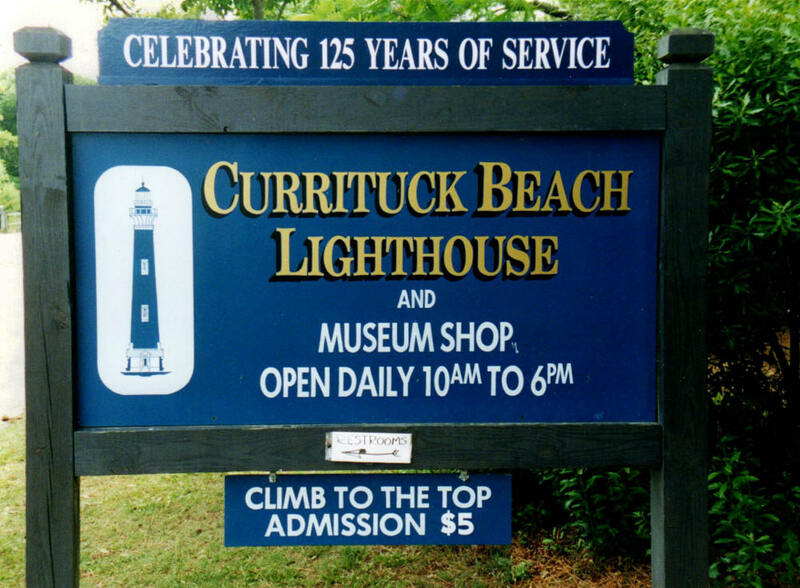 There is a Light Station Visitor Center and Keepers' Quarters Museum also on the premises. 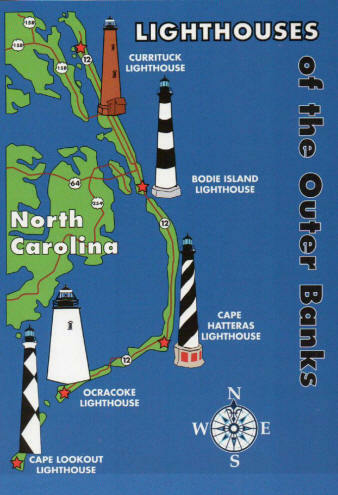 The wild horses of the Outer Banks are North Carolina's official state horse. 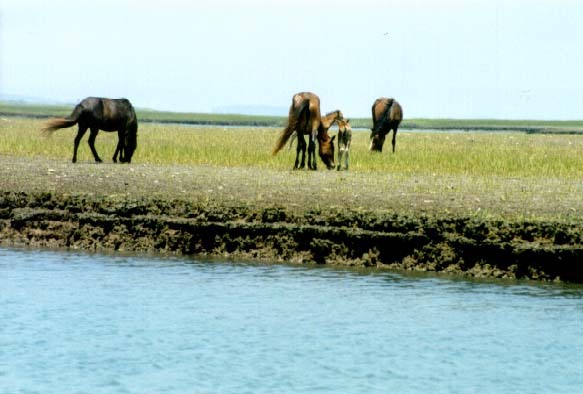 These mustang ponies are descended from horses brought here by Spanish explorers of the New World and have lived there, stranded, for more than 500 years ago. 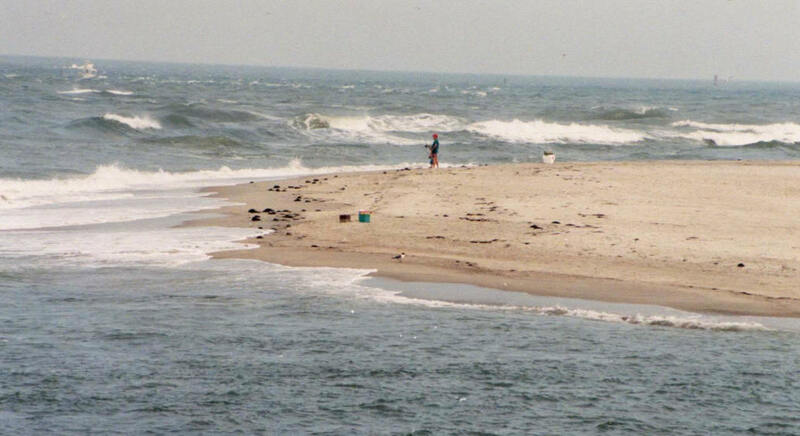 It's because of this desolation, coupled with the help from the Corolla Wild Horse Fund, that the wild horses are able to thrive, relatively undisturbed by the limited development that has sprung up around them. 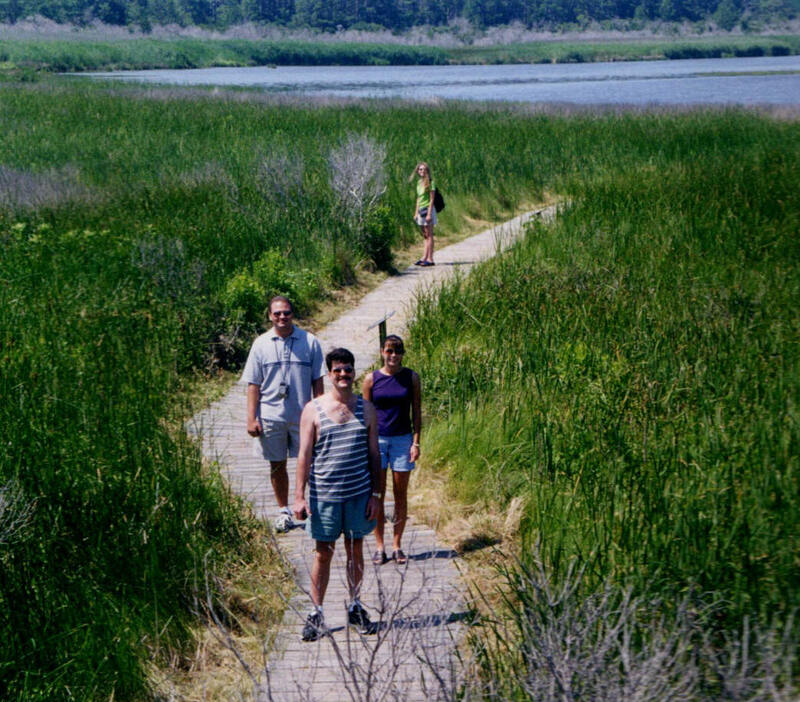 It is illegal (and dangerous) to approach within 50 feet of the horses. 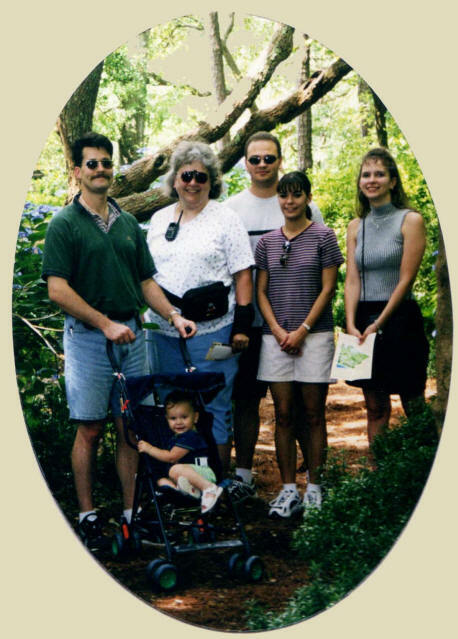 It is also illegal to feed them. 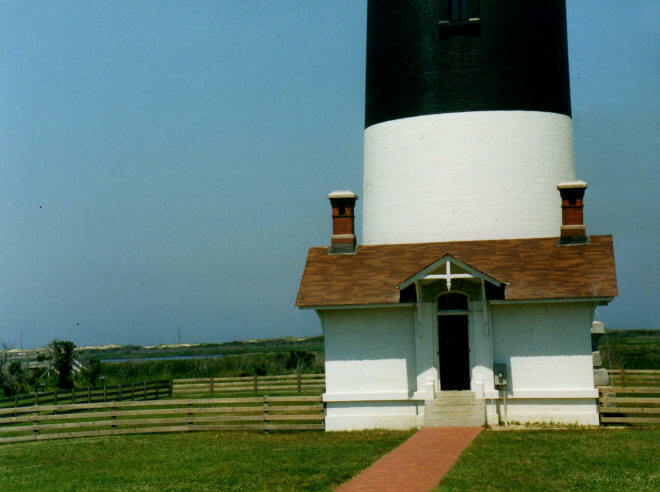 Wild horses have a very different diet from domesticated animals. 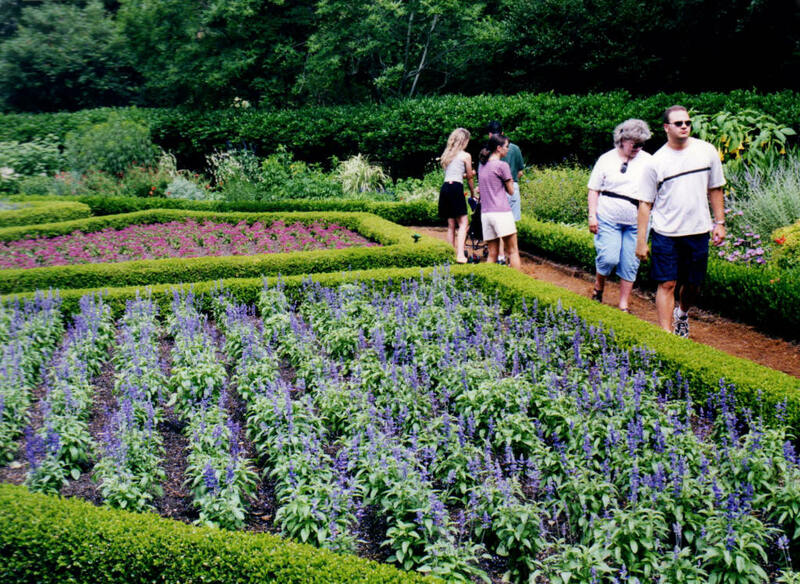 Fruits and vegetables can cause serious injury or even death to the horse. 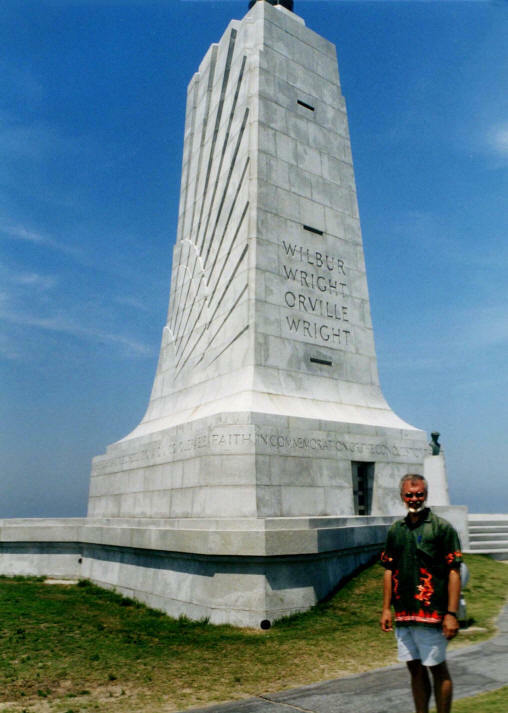 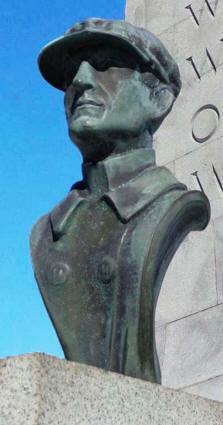 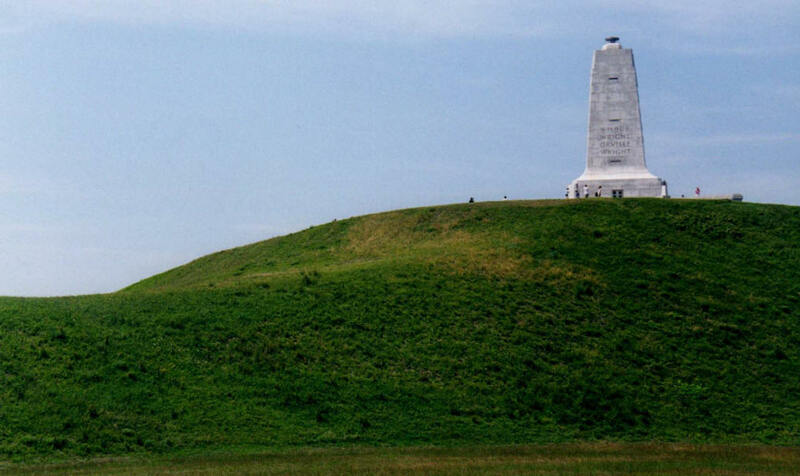 On Wednesday, 20 June 2001, we decided to visit the Wilbur & Orville Wright Memorial where we were staying in Kill Devil Hills, NC. 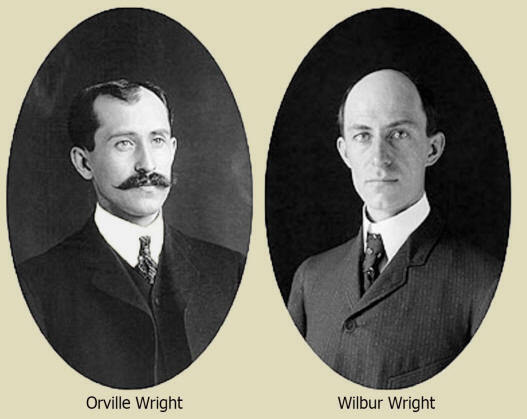 Wilbur and Orville Wright made the first controlled, sustained flight of a powered, heavier-than-air aircraft on 17 Dec 1903, four miles south of Kitty Hawk, North Carolina. 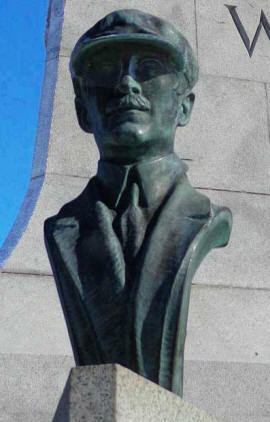 In 1904–05 the brothers developed their flying machine into the first practical fixed-wing aircraft. 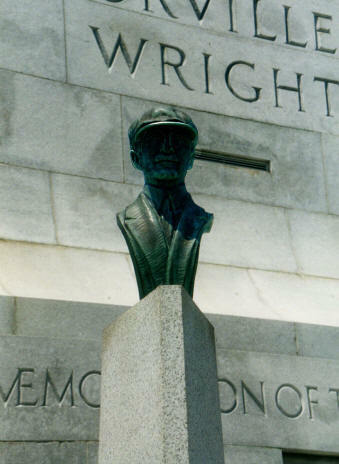 Although not the first to build and fly experimental aircraft, the Wright brothers were the first to invent aircraft controls that made fixed-wing powered flight possible. 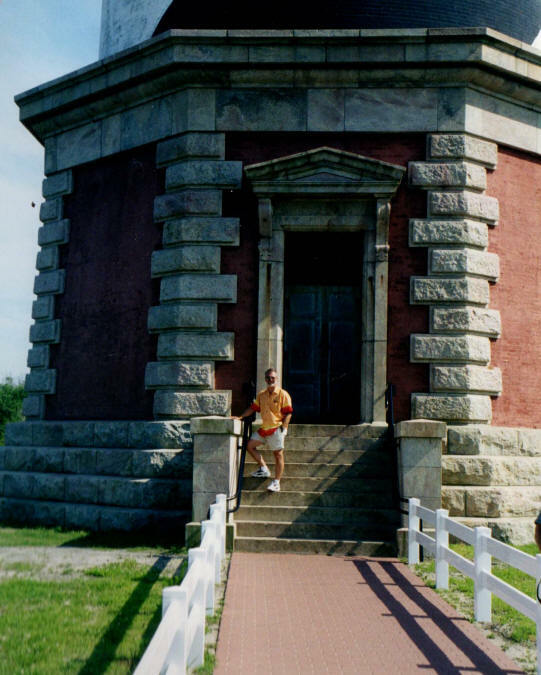 The Visitor Center is home to a museum featuring models and actual tools and machines used by the Wright brothers during their flight experiments including a reproduction of the wind tunnel used to test wing shapes and a portion of the engine used in the first flight. 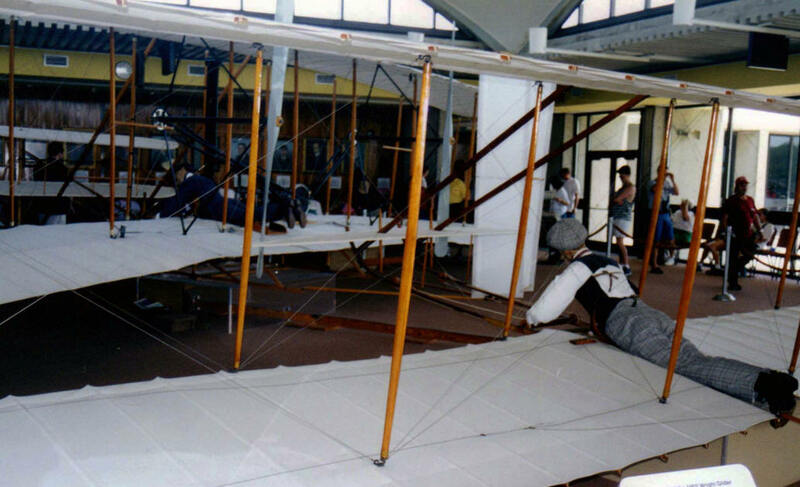 In one wing of the Visitor Center is a life-size replica of the Wright brothers' 1903 Flyer, the first powered heavier-than-air aircraft in history to achieve controlled flight (the original being displayed at the National Air and Space Museum in Washington D.C.). 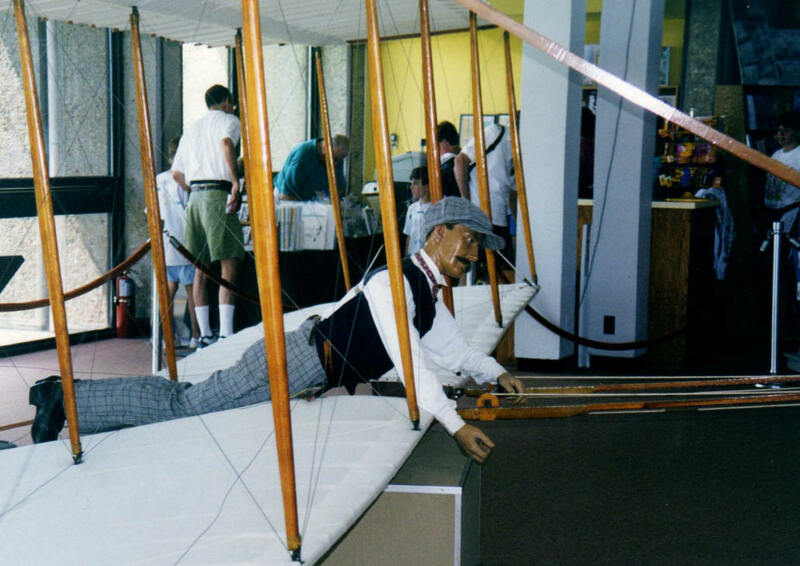 A full-scale model of the Brothers' 1902 glider is also present, having been constructed under the direction of Orville Wright himself. 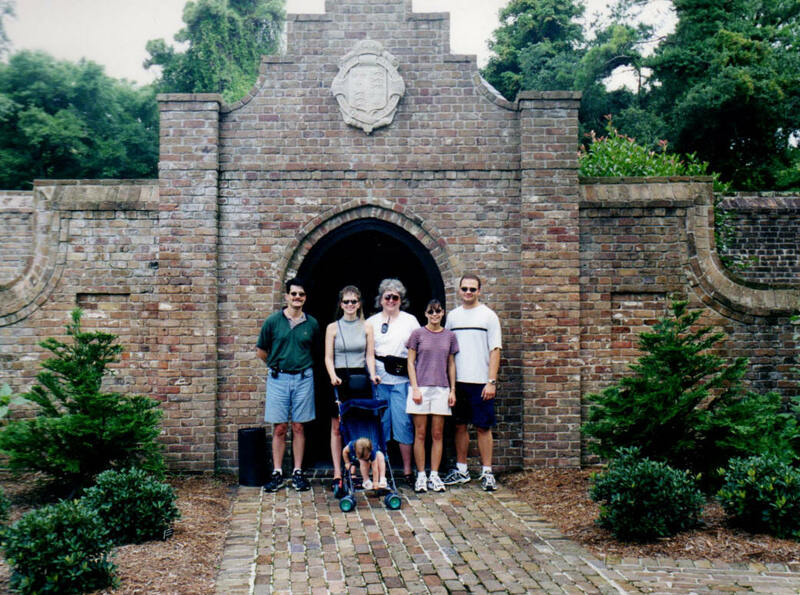 For most of the time, our family has typically gone to Myrtle Beach, South Carolina when we wanted to got to the beach. 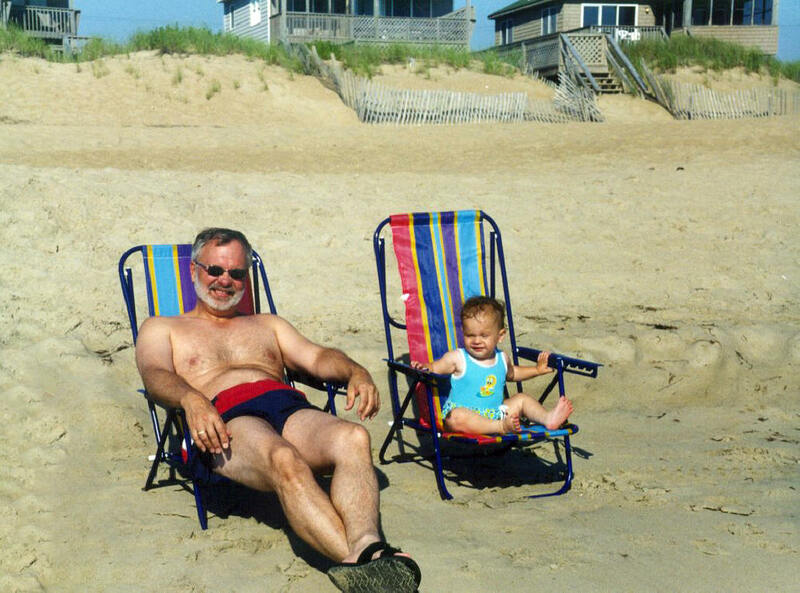 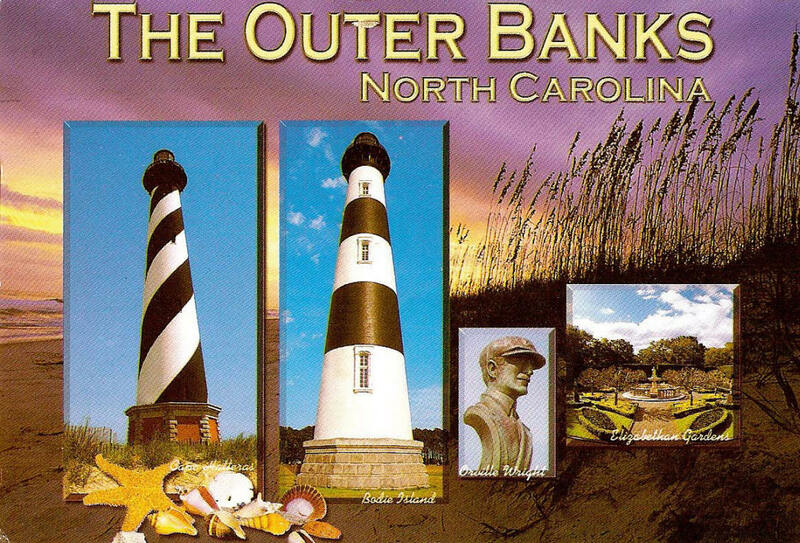 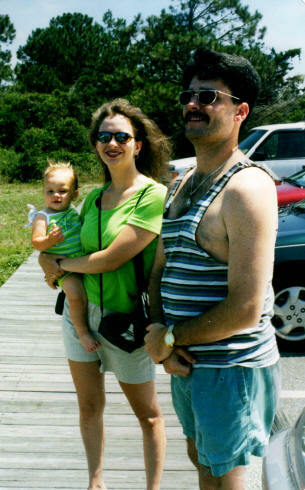 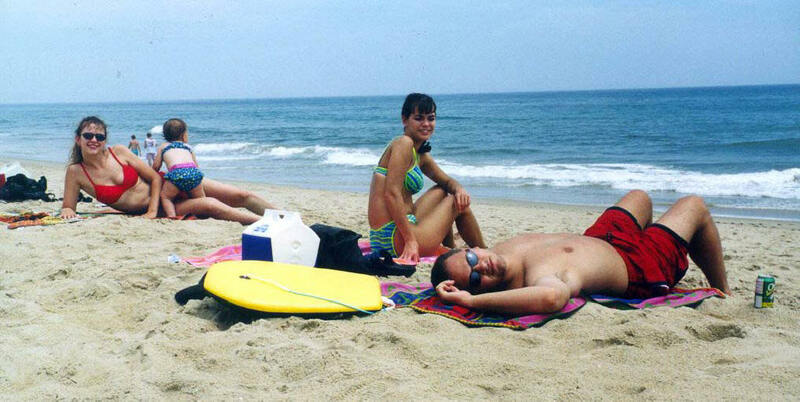 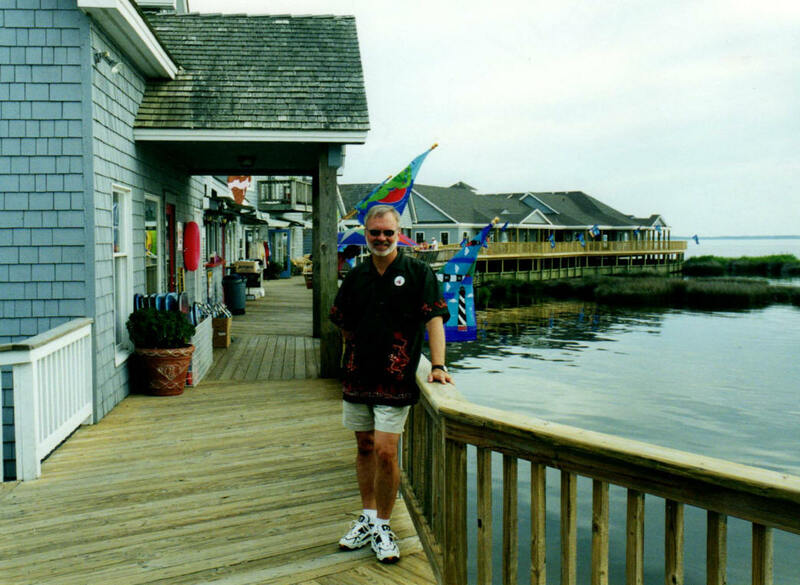 In 2001, we opted to go to the North Carolina Outer Banks.